Quest Ubiquinol Qu10 + Vitamin B6 contains synergistic vitamin B6 which contributes to normal energy yielding metabolism and to the reduction of tiredness and fatigue. Providing 100mg of Coenzyme Q10 in the innovative ubiquinol acetate form. 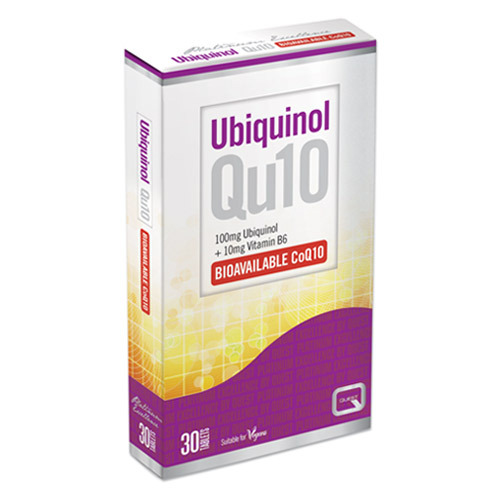 Ubiquinol acetate provides a higher bio-availability of ubiquinol in a stabilised form. Microcrystalline Cellulose, Di-Calcium Phosphate, Ubiquinol Acetate, Coating (hypromellose, Microcrystalline Cellulose, Stearic Acid, Colours: Iron Oxide Red, Titanium Dioxide) Magnesium Stearate, Anti-Caking Agent: Silicon Dioxide, Pryridoxine Hydrocloride. Store in a cool, dry place below 30ºC. Below are reviews of Ubiquinol Qu10 + Vitamin B6 - Bioavailable - 30 Tablets by bodykind customers. If you have tried this product we'd love to hear what you think so please leave a review. Was recommended this product by my local health food store as my husband takes statins....I purchased from bodykind.com as they were nearly £5 cheaper! My husband has felt a big difference in his energy levels & general well-being since taking this supplement!